Lviv is said to be the Central European city which has graceful domes of its many cathedrals, and chimneys on its tiled roofs. One can get the scent of freshly brewed coffee when you pass through derelict houses here, doors are mysterious here and houses have romantic courtyards. 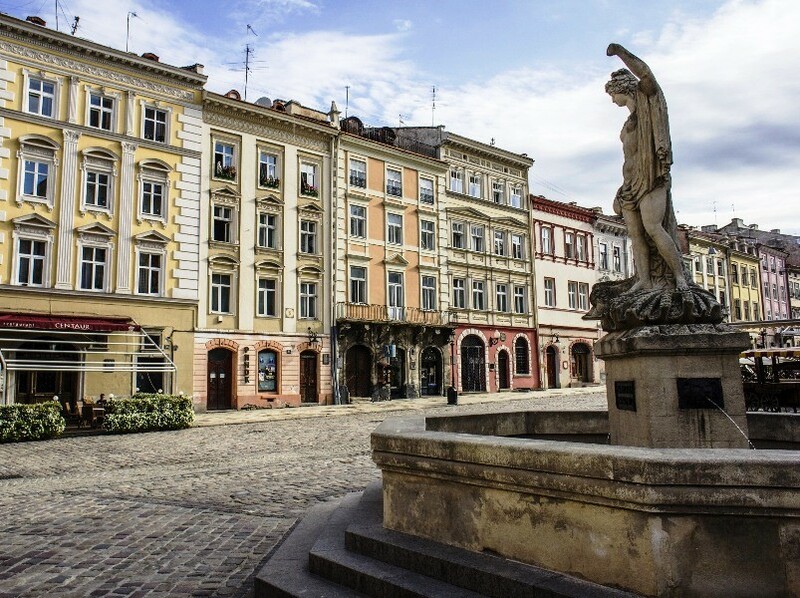 Travel connoisseurs also find Lviv’s elegance a surprise factor. 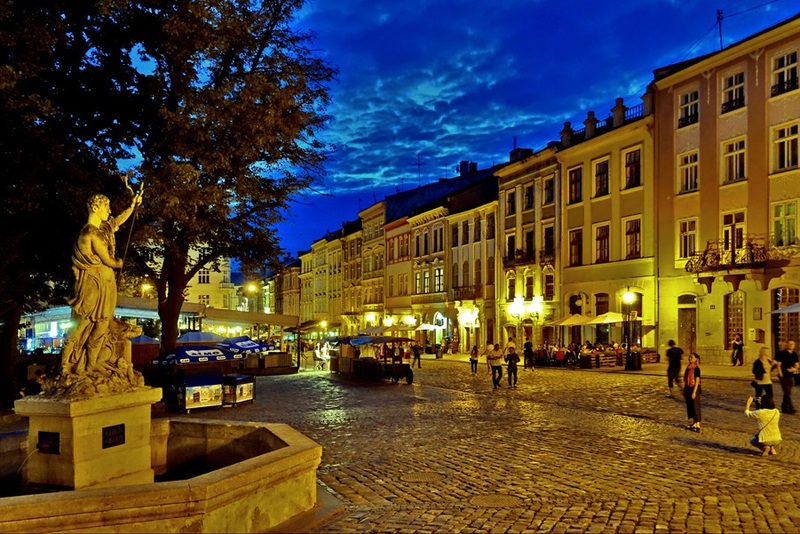 It is right to say that Lviv attracts more visitors than any other city in Ukraine. And so Lviv has been rightly rewarded as Ukraine’s number one tourist place. In such a beautiful city there is Ploshcha Rynok or Rynok Square, a central square of the city of Lviv in Ukraine. 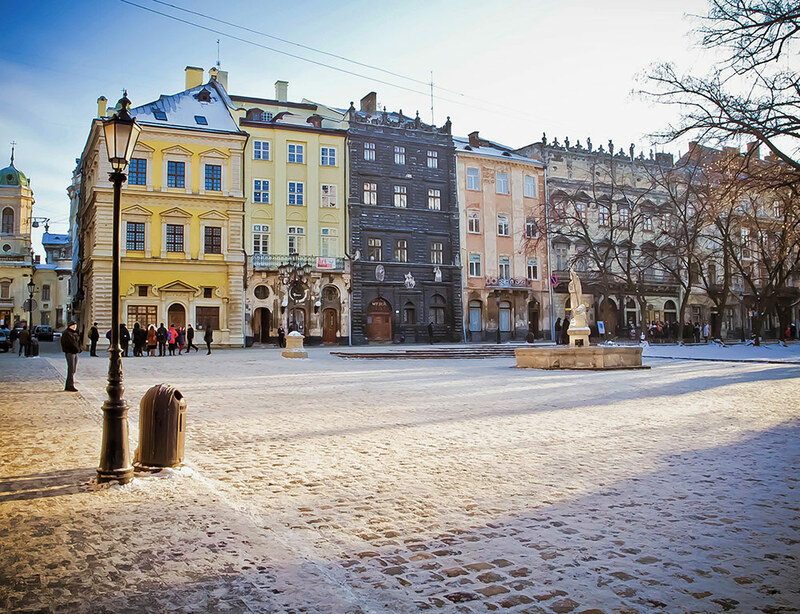 The square was planned in 14th century but most of the Lviv city was destroyed by a great fire in 1527. 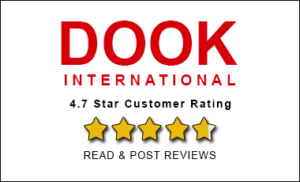 Let us see more about Ploshcha Rynok. Soon after Lviv was located as city the Rynok Square was designed too. Orginal architecture of the buildings here were Gothic but after the fir in 1527 which destroyed most of the city, they were rebuilt with few remaining Gothic architecture. The square was designed Rynok square is rectangular in shape and measures 142 meters by 129 meters and out of every corner of it two street radiates. In the middle of the square there was row of houses, and the southern wall made by the town hall. In 1825 when the tower of the town hall was burnt all houses nearby were burnt too and then in 1835 a new hall with 65 meter tower was built. The architects of this tower were J. Markl and F. Tresscher. Today there are as many as 44 tenement houses around the Rynok square. All these houses represent different architectural styles. You will see fountains and statues in all the four corners of the square. 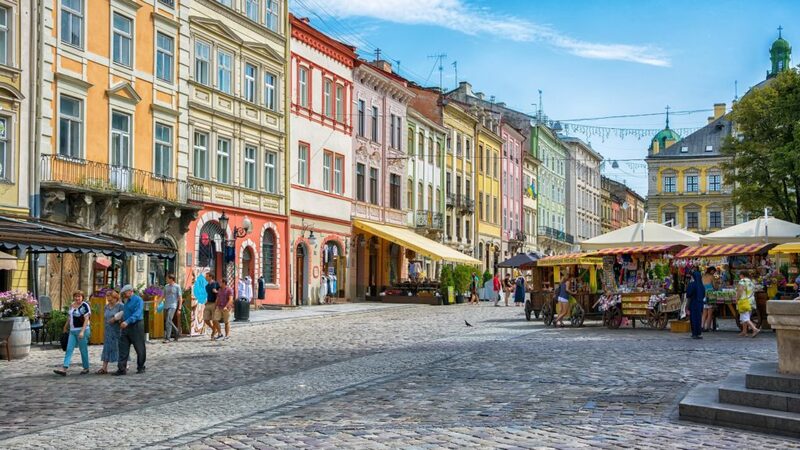 Ploshcha Rynok was recognised as world heritage site by UNESCO along with historic city center of Lviv in 1998. There are number of houses on all sides. These houses look unique with small sculptures, balconies, lanterns and golden details. People in number here gather around these houses, fountains and statues. The eastern side is most notable. On all the sides there are houses of significance. There is Bandinelli palace on the north-eastern corner which was built in 16th century and was destroyed during World War II and was rebuilt in its renaissance style. Then there are two outstanding houses in the market square. They are rococo building and the Black house. They have unique appearance. Black house when originally built was in sandstone but over the years it turned black. Likewise on all sides there are houses and buildings worth noting. Today some are used as restaurants, cafes or shops also. Market square has a lively feel and is one big outdoor museum of medieval houses. Just off and around the Rynok square also there is very much to see and experience. You can see The Latin cathedral, the Chapel of the Boim family, the Armenian cathedral, backstreets and alleys – and much more. You should walk to the top of the tower of Ploshcha Rynok square and you can enjoy spectacular views of the Lviv city and down on Rynok square. All the houses and statues give you a different perspective when you see them from the top of the tower of the Ploshcha Rynok square. You should go to Ploshcha Rynok and spend some time. Capture some beautiful images from different places and corners here. 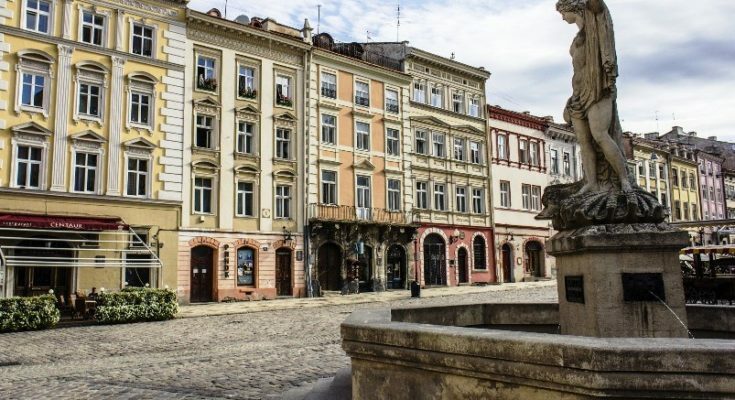 The museums located at the Rynok square represent the historical aspects of the Lviv city with its antique furniture, old photographs and other artifacts which belong to old Lviv. When you visit Rynok square you will listen many fascinating stories and you can live through that imagination for some time. So when you are going to take Ukraine travel package next time then do go and visit wonderful Ploshcha Rynok in Lviv.